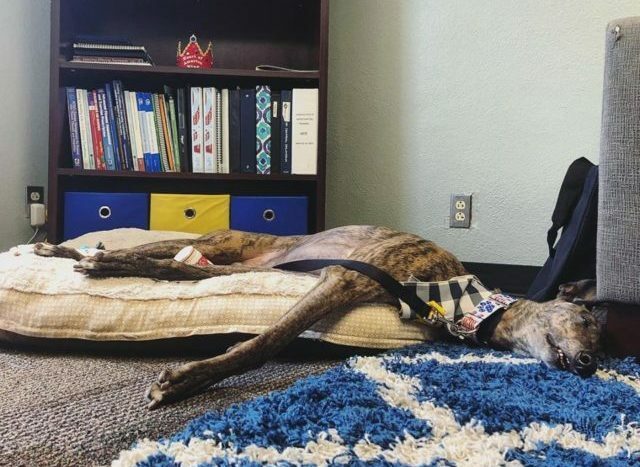 During his two years as a Florida racing dog, Kevin the Greyt averaged 37 miles-per-hour and finished in the top three in at least half of his races. But that’s not how he earned the regal title at the end of his name. That was bestowed upon him by his adoptive mom, Alex Russell when he became the University of Central Oklahoma’s first on-campus therapy dog. “I knew he was destined for greatness once he started working at UCO and I saw him interact with students,” Russell told iHeartDogs. 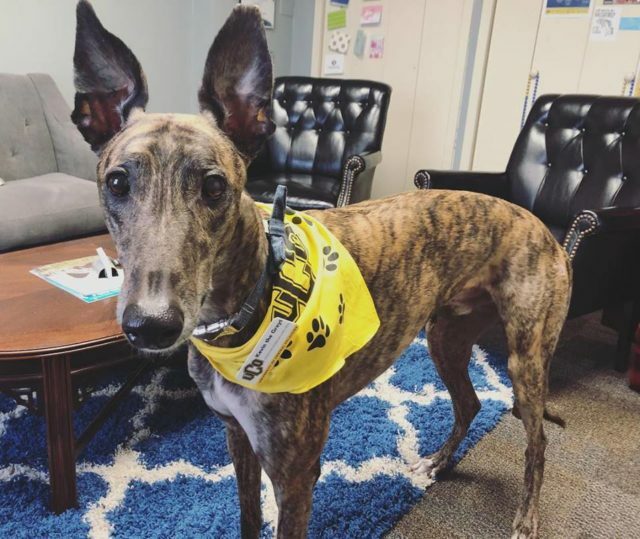 When Kevin was five-years-old, he retired from racing and was taken in by the Oklahoma-based rescue, Hounds of the Heartland. After a year with a loving foster family, Russell and her husband adopted him in November 2016. 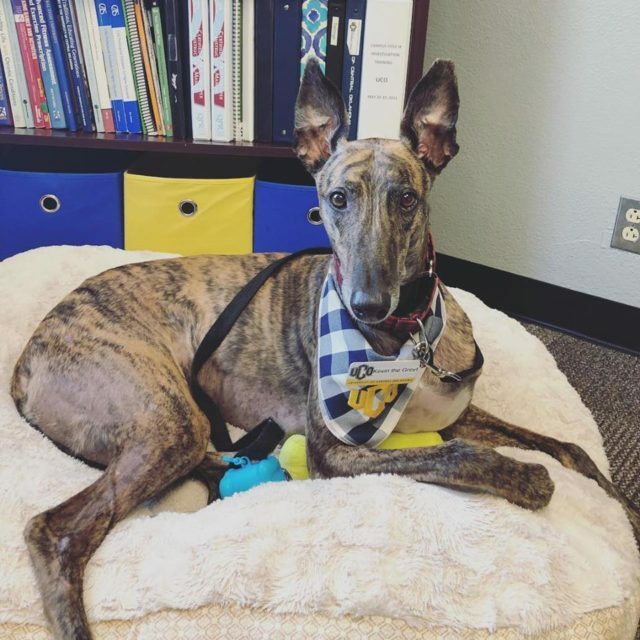 As the Assistant Director of Health Promotion at UCO’s Center for Counseling and Wellbeing, Russell immediately recognized the dog’s potential for service. Within six months, Kevin earned his therapy dog certification and began offering support to the school’s students and staff. He even has his own ID badge. Together, Russell and Kevin are working to establish an on-campus therapy dog program at UCO modeled after the Pete’s Pet Posse Program at Oklahoma State. Like them, they hope to build a team of highly trained dogs and handlers to improve the physical and emotional health of the campus community. When Kevin isn’t strolling the halls and courtyards of UCO, he is dozing on his cushy bed in Russell’s office. On his off days, he enjoys going to the dog park, squeaking his squeaky toys, eating peanut butter, doing zoomies throughout the house, and of course, napping. But if a student is in need of his special brand of soothing therapy, they have only to scratch his ears to rouse him. Kevin is a sucker for a good ear scratch! In his time at UCO, he has helped students and faculty cope with issues from simple school stress to panic attacks and the loss of loved ones. For Kevin the Greyt, it’s all in a day’s work. 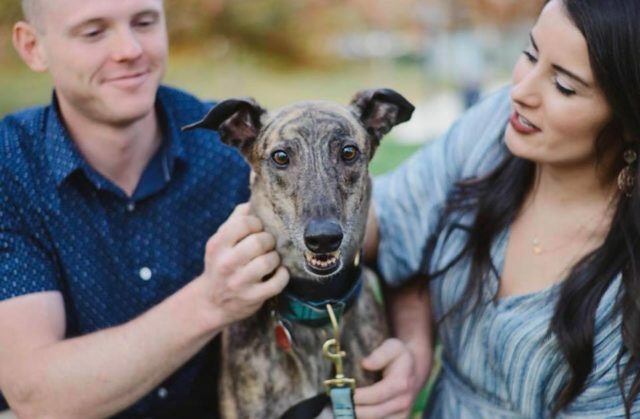 For Russell, the decision to adopt a retired racing Greyhound was a no brainer. Florida’s midterm election vote to ban Greyhound racing has left as many as 15,000 dogs with uncertain futures. The state’s 11 tracks will shut down gradually over the next two years. In the meantime, rescue groups across the country – including Hounds of the Heartland – are preparing for an influx of retired racers. If you would like to learn more about adopting or fostering one of these wonderful family pets, visit Adopt-A-Greyhound.org. The site features an interactive map to help you find the nearest Greyhound adoption group in the US, Canada, Europe or Australia. Don’t forget to follow Kevin the Greyt on Facebook, Twitter and Instagram!